With our new corporate identity and the product design that accompanies it, our platform takes a quantum leap forward towards becoming the nerve center for businesses and their sales teams. Pipeliner CRM today announced the launch of a new version of their 5-star-rated Pipeliner CRM software. This release, which the company calls Elements because of its foundational clarity, adds several new dimensions to the company’s go-to-market strategy. Known primarily as a visually-focused CRM, the company now adds a completely new design and logo. The dynamic design reflects the company’s growth and momentum and demonstrates the bright, clean focus throughout the product and the brand. With Elements, the company re-envisions CRM. Several new elements shape Pipeliner’s vision of modern CRM and its central role in the modern business environment. Pipeliner CRM is the first and only CRM solution rooted in proven and longstanding economic principles. Far more than just a CRM solution, the company is focused on enabling business success for its thousands of customers. “We’ve been moving and growing so quickly, we knew it was the right time to take an even larger role in helping CRM evolve,” said Nikolaus Kimla. “With our new corporate identity and the product design that accompanies it, our platform takes a quantum leap forward towards becoming the nerve center for businesses and their sales teams." Today’s B2B sale never starts or ends with just one person involved in the buying decision. The Elements release is highlighted by a feature known as the Buying Center, a one-of-its-kind of visualization enabling Pipeliner CRM customers to map the organizations they sell into. 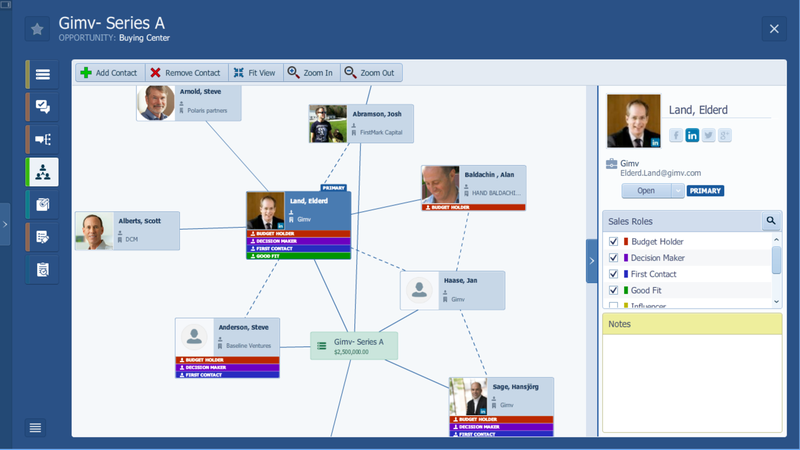 Automatically include a true “relationship graph” of all the ways multiple Contacts and Accounts are interconnected. Allow users to designate multiple Influencers and Decision Makers associated with any Opportunity; and can be included in the Buying Center. Add valuable context Contacts (e.g. you will see Contacts’ roles with custom color coding to identify how they fit into the buying hierarchy). Allow users to add Notes for any Contact. Belief that salespeople -- the entrepreneurs within the enterprise --must be supported to sell as only they know how. If there is a word that sums up business in the 21st Century, that word is entrepreneur. Pipeliner CRM is built to support the traits of salespeople -- called “salespreneurs” -- because they are the entrepreneurs in any enterprise. Support sales management. It takes management’s understanding, coaching and mentoring of salespeople, both individually and on a team level, to support the entrepreneurial salesforce. Focused on strengths, not weaknesses. While the traditional approach has been to pick out weaknesses and attempt to rectify them, the company believes that the better approach is to focus on the strengths of various team members. Speaking in a universal language. That language is Visual. Every human being understands a picture. Pictures tell stories. Committed to education and training. The real way to strengthen skills is to educate thus education in Pipeliner CRM is extensive with a Sales Reference Library, through ebooks, and our blog. Building Pipeliner CRM to enable salespeople to focus on results. In any enterprise or activity, the most crucial principle is to focus on results. The core principle of Pipeliner CRM is visualized with fivefold targets and the one-screen policy.